I haven't seen a lot of reviews for the Urban Decay Naked Skin Weightless Ultra Definition Liquid Makeup (that's a mouthful), so I want to share my take on the foundation. It has a very wide range of shade with a total of 18 shades. Mine is 4.5. At stores, they have a little plastic thingie that you can pull out and put on you skin to see what your shade is. I tried it and the thing says that my shade is 3, but I tried the sample and 4.5 fits me better. So try it out yourself. The packaging is so nice with clear container and with pump on top. So it makes it sanitary. I just pump a pea size of product on the back of my hand and dot on different parts of face and neck then blend it with my F80 kabuki brush by Sigma. I can think one word that best describe this product: lightweight. It is so lightweight, that sometimes I forget I have makeup on. It lifts up to its name, weightless liquid makeup. It really (almost) is! The finish is smooth. It has velvety and flawless finish. It doesn't cake up or anything. The product literally acts like a tinted moisturizer with better coverage. Even though it's lightweight, you still can expect great coverage. I would say it has medium coverage. 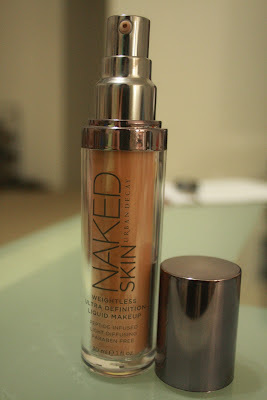 If you have problem with discoloration, Naked foundation will help even out your skin tone without putting too much product. It can cover your blemishes and sun spots. I hardly use my concealer when I use this foundation. What I love most about this product is it does the job without having to pile up on a lot of products not like many of drugstore foundations. The retail price is $38, and you get quite a lot of product. I got mine from Sephora and I had a 10% off coupon and $10 gift card, so it was a great deal for me. Would I repurchase this for the full retail price? Absolutely. With the result I get, I wouldn't doubt to repurchase this. I can't say that this is the best foundation out there considering I haven't tried many, but I can say that this is a great product to have in your makeup essentials. Its weightless finish makes it comfortable for everyday use.